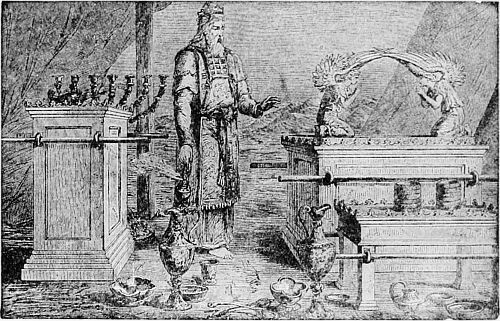 High priest, altar of incense, and the Ark of the Covenant, by William Hole, in Jesse Lyman Hurlbut, Life of Christ for Young and Old (1915). Although priests were a major office in Israel under the Mosaic covenant, the New Testament never refers to any mortal as holding the office of priest in the Christian church. The apostle Peter referred to the Christian church as a whole—not to authorized individuals within the church—as “a royal priesthood” (1 Peter 2:9). Jesus Christ himself is the only individual today who holds a priestly office or position on behalf of those who believe in him, as is made clear in the Book of Hebrews, which exalts Jesus alone as our one heavenly high priest. The priests of the Aaronic order represented the covenant God made with Israel through Moses, a covenant that has been superseded by the new covenant through Jesus, the eternal priest typified by Melchizedek. Jesus alone holds this position because he alone lived a holy, sinless life, offered the perfect and final offering for sin by his own death, rose from the dead to immortal life, and ascended into heaven where he functions as our great high priest (Hebrews 7-8). We may be assured that these things are all true about Jesus because there is solid historical evidence showing that Jesus’ death and resurrection really happened. 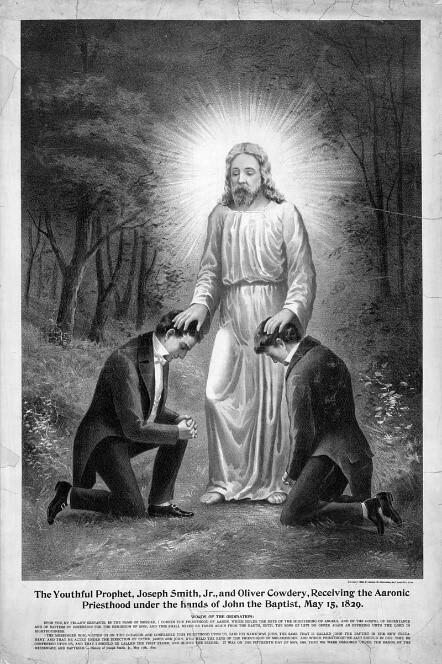 The youthful prophet Joseph Smith Jr and Oliver Cowdery receiving the Aaronic priesthood under the hands of John the Baptist by George Crocheron, 1889. By contrast, Mormonism claims that what separates it from traditional Christianity is that the LDS Church has exclusive authority to speak and act for God because its men alone hold “the priesthood.” In Mormon doctrine, the priesthood is divine power conveyed through the laying on of hands in two priestly orders, the lower Aaronic priesthood, held by worthy Mormon boys from age 12, and the higher Melchizedek priesthood, held by worthy Mormon men. These priesthood orders flagrantly conflict with biblical teaching. According to the Bible, the Aaronic order consisted of men from the tribe of Levi charged with performing sacrifices in the temple; this order became obsolete when Jesus offered himself as the perfect sacrifice for sins. Mormon boys are not Levites and of course do not offer sacrifices. There is no literal “order” of Melchizedek in the Bible; the book of Hebrews uses the expression figuratively to refer to Melchizedek as a type or foreshadowing of Jesus Christ as the eternal, heavenly high priest. The Mormon priesthood is not only unbiblical, it is of dubious historical origin. Joseph Smith claimed that in 1829, the year before he founded the LDS Church, he received these priesthood orders from resurrected biblical figures; however, no one heard any such claim until about 1833 or 1834. References in Doctrine & Covenants to his receiving the priesthood were added years later to earlier “revelations” that originally made no mention of the supposed event. Thus, Joseph had to doctor his own revelations to make it appear that he had an authority he never claimed when he founded the LDS Church. Mormon Priesthood: Do Mormons Alone Have the Power?